How do you create a prosperous startup community? Throughout the last couple of years, I’ve been involved in helping out in different ways to create a prosperous tech and startup community in Gothenburg, Sweden. I would not say that we have been super successful, but we have made progress. As an organizer of events, observer of the community and involved in discussions on the topic, I thought I could share some of what I think is important to create a prosperous startup community. Beside the different aspects that I share below, I agree a lot with steve blank’s thoughts on the “Pay it forward”-culture. Consider what is written as my opinions, and not facts. My observations are quite limited, and may not apply to other tech and startup communities. In order for a tech and startup community to be prosperous it require events. Events both act as a great way to make people talk to each other in order to create networking effects, but also a neat entrance for “new” people into the community and world of tech and startup. No matter what I think about the mixture of event types, and which kind of organiser it is, I believe the most important key for a prosperous community is that it is open and easy to join for “new” people. “New” people are all those individuals who are curious about startup and tech, both people who are about to take the decision on where to start their career, like youths and students, but also people who are tired of their career and want to try something new, like consultants or people at larger corporations. Without these new individuals, the community becomes a closed group, and dependant on those who are already in it. Furthermore the community will unconsciously send the message that the community is for the “startup elite” and not “an everyday person”. In order to create an wide range of events that enable networking effects, make people feel included, and do not only rely on a few number of persons there are two parameters where it is important to find the sweet spot. The non-profit events rely on driven people who engage themselves within the community. There are always a few of these people within the community, who are willing to put in hours and engagement without getting anything back in the form of money. However, the number of these people often increase in an active community with a lot of events. A lot of events cause more people to become motivated to organise an event upon their own idea. However, if there is too few non-profit events organised in a community, the community tends to rely a bit too much on a few individuals. If these individuals move, or lose their motivation to organise events there is a big risk that the community halts up. The for-profit events on the on the other hands are events organised by companies who have a self-interest in organising the event. Often it is to build their brand towards potential recruits or customers. However, too many of these events compared to the number of non-profit events may cause a situation where people focus on the opportunity to join an already existing startup, rather than the opportunity to create their own together with people they meet at those events. Therefore in order for a community to grow and prosper it is important to find the sweet spot between the amount of events that are organised for profit, and the amount of events that are organised without any aim for profit. 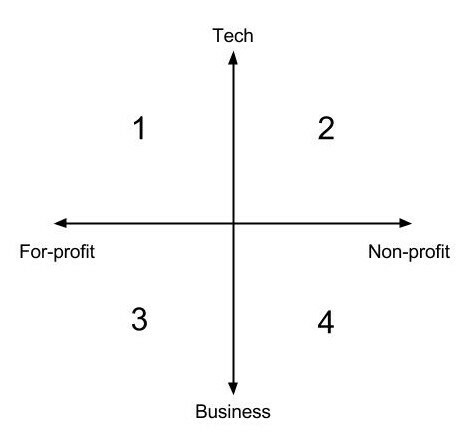 The balance between the amount of events within tech and business is also important to create an open and inviting community which grow in a sustainable way. I think too much events within tech can cause an atmosphere where people “over-engineer” products and tend to forget the customers. The business folks feel excluded and it become a gap between the two groups. However, the other way around is not any good either. Too large focus on the business side, pitch events and networking events where you exchange business ideas can cause the tech people to feel excluded. An unbalanced event community in any direction can cause a gap between the equally important groups. The tech people look at the business folks and think they are just talking a lot of b*llshit, meanwhile the business guys look at the tech people and think that they are stupid since they do not understand the value of an idea. To find the sweet spot where both parties are included, with events that match these two groups together, is important for a community to grow and utilize the networking effects that these types of events can create. For a tech and startup community the networking is important, as mentioned in the first section. It leads to contacts who can help you to grow, solve your problems or just to bounce some ideas with. However, I believe more networking is not always better networking. In my opinion only talking a lot without any action can lead to a community where ideas and thoughts are valued too high. An idea could be great and a foundation and vision for a startup, but it is the execution that matters. Without a team that execute, the idea will remain just what it is: an idea. A network where no one are doing anything, often leads to formations in the network where people high-five each other and think they are great, without them actually creating any value. However, to just execute, and not network at all, is not a viable option either. You will probably end up doing the same mistakes as other people in your community. You will repeat administrative tasks that others already done and has templates for. You will have a harder time getting hold of the people you want to get in touch with, since you do not have anyone who can introduce you. Execution is important, but it must be combined with networking in order for a tech and startup community to prosper. A Swedish entrepreneur called Jarno Vanhatapio, has founded several companies on the foundation: Think big, talk big, walk big. At his current startup NA-KD, there is a sign at the door: “Vision is king, but execution is King Kong. So pls walk the talk when you enter this office.”, which clearly tell us that both parts are important, but only if both parts exist. For a tech and startup community to be prosperous, sustainable, and attractive to the people, it is important to find the sweet spot between talking big and walking big. What should be said, is that networking level often can depend upon how good the access to cash is. The larger amount of cash in a region where the tech and startup community lives often drives more investments and therefore create a better access to the cash. In the next section we will dive deeper into this area, but what should be said here and now, is that with better access to cash, I believe the competition between investors rise, which make investors to put money in projects with higher risk. Higher risk means startups in earlier phases, which makes it easier for the “lifestyle entrepreneurs” to get investments on their ideas, causing a community where networking and talking becomes valuated in proportion much higher than execution. However, if the access to cash is bad, people will rather focus on creating a cash flow and deliver on KPI:s, which can lead to the next investment for the project. This can although be contradictory since network effects will not happen to the same extent, and projects grow slower than they would have with a healthy network in place. As mentioned in the section above the access to cash can affect the networking level to some extent. Better access to cash create an environment where startups with higher risk are rewarded since the competition between the investors rise and they need to find the startups earlier than before. However, too good access to money will promote the “lifestyle entrepreneurs”, creating a “high-five mentality” where there is a lot of talk, and not so much action. In the end I think this can lead to that people rather invest their money in safer forms like real estate, since too many startups crash. A healthy access to cash create a healthy environment where crazy ideas are motivated, but too crazy ideas are told to think one more time. It is also important where the capital come from, since Venture Capital (VC) firms and Business Angels (BAs) invest in different stages. If there are too few VCs, it might become too big of a gap between those who invest in pre-seed/seed, and those who invest in Series A/B. This especially occur if the VCs that do exist origin from another region where a seed round might equal a Series A in the first region. However, too few BAs might generate too few startups that reach Series A, since there are a lack of people investing in pre-seed and seed rounds. In my opinion a healthy startup ecosystem have investors which can help out from pre-seed to Series B and maybe further. After the Series B phase I believe startups don’t have to move the company to other cities to the same extent to attract capital. And if they have to do so, the startup have reached a size when it is reasonable to open up new offices in other cities. Another interesting observation in Gothenburg is that low access to cash create 1) more B2B startups, and 2) alternative ways to finance your startup. Low access to cash is not as big of a problem for B2B startups with early cash flow as it is for B2C startups. An early cash flow is great, and needed to create a healthy company. However, B2C generate more “buzz” in the community, since more or less every person is a potential customer or someone who can help you spread the word about the startup. For a startup community the “buzz” is really important since it create an environment which feels alive, even though you are not in the middle of it. 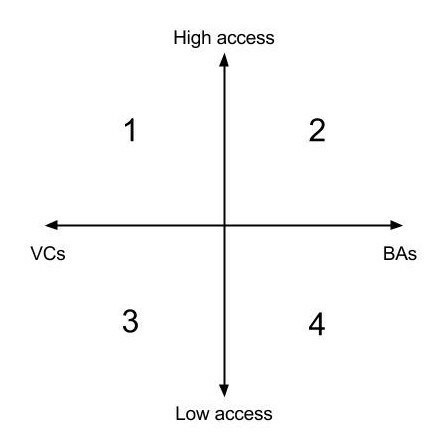 Low access to cash also force alternative financing solutions for the startups. One common solution is to combine being a consultant and running the startup in order to avoid burning money too fast in the startup by paying full salaries. However, this setup may put too little focus on the startup, which might cause ideas to not get fully verified or that startup miss their window of opportunity. This solution is in my opinion a good alternative up until the seed round at max in order to not dilute the founders too early. He argue that the “right people” will get the bus to its final destination, no matter in which direction you drive. With a great flow of talent a snowball effect is created, where talented people get recruited by startups, which motivate more people to join startups in order to work with skilled people. If the flow is too low, there is a risk that consulting companies and large corporations will hire all talent there is, since they have the assets needed in order to be seen and heard at the universities. On the other hand there can never be too large access to talent in a community, even though it can cause people to move to other cities due to the high competition between talents. The focus should alway be to find the sweet-spot. I believe a prosperous startup community is generated from these sweet-spots. In order to reach these sweet-spots, it is required that people involve in the community, and that companies and the city as such also engage in the work. If there are too few non-profit events, maybe the city needs to step in and make it easier to run those kind of events. If there are too little cash for early stage startups, maybe the city or larger companies needs to create solutions that enable early stage financing such as soft loans and pre-seed money. And if the flow of talent is too low, maybe the city needs to step in and promote the city in order to attract talent from other geographical regions. It is extremely hard to create a prosperous startup community, but I think that if you strive to find these sweet-spots more companies will be successful, which in the next step create an atmosphere which motivate new people to engage and involve in the community. Head of Growth @ Football Addicts. Co-founder of @gbgtechWeek.